I’m a relatively new barista but really enjoying mastering the craft and experimenting. I went back and forth on best ‘budget’ machine and decided on the Rocket Apparento and Eureka Mignon. 'budget' in the context of a heat exchange system, which is a big step up ($1K) in cost from a 'budget' single boil unit. Heat exchange systems are really nice if you need to produce any volume though. Moka pot for "espresso" and a V60 pour over for my coffee. I bought this used Diva and Super Jolly back in 1998 (She was built in '92). Been going strong ever since. Very nice! I particularly like the nook and lighting. Is cringing in its non-chromed dish strainer next to a 2 lb bag of pre-ground Costco French roast. Last edited by eddief; 10-09-2018 at 05:51 PM. A moccamaster and a cuisinart burr grinder that I run the night before because it's too loud for the before coffee time. I've placed a couple orders from Trade. How do you like the new bag each week? The times I've switched it seems like it takes me 10 shots just to get the grind dialed. The program is new, but Ive been ordering a bag a week lately of randoms b/c of the free shipping. it's a big draw when you're going through a bag of week, generally three doppios a day total between my wife and I.
I am not that fussy on dialing in as I drink through it. I just figure it out as I go, to some degree. Plus I feel like Ive been dialing in long enough it takes a round of shots, maybe two, until I am in pretty good shape. Last edited by livingminimal; 10-09-2018 at 06:11 PM. I can make a pretty spectacular cup with my Aeropress. Decent beans ground at the time of use. 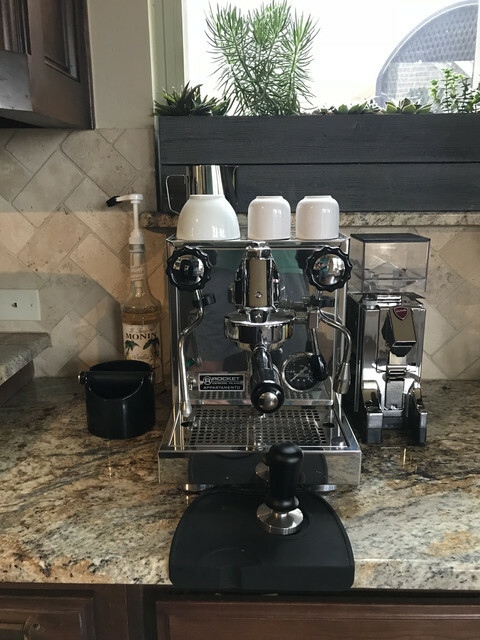 My espresso rigs are a hacked Silvia with a pid and a Rocky. I'm waiting for livingminimal to get sick of coffee and hook me up with a Rocket. PIDed Isomac Zaffiro and a Rocky. I'm waiting for livingminimal to get sick of coffee and hook me up with a Rocket. Honestly, Aeropresses are amazing. Back this fully. My espresso rigs are a hacked Silvia with a pid and a Rocky. I need to swing by and see this silvia. That's awesome.